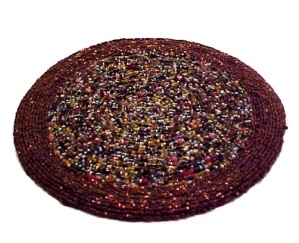 Victorian Era round Matt Hand Crafted of Seed Beads starting at the center and spiraling outward in a circle. Made of Czech glass seed beads, tubes, faceted beads in a variety of colors, with a 1" edge of copper seed beads. It has been stitched on to a cardboard and covered with dark brown fabric. Gently Used. Very nice, you will love it!